Hey guys. This is going to be part one in my series “Learning the Letters”. Today, we are going to discuss the X. 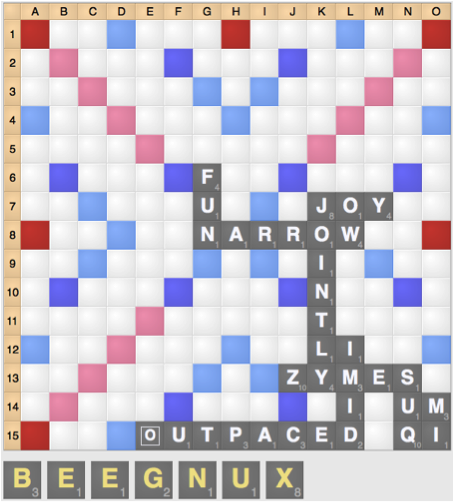 The X is perhaps the simplest and easiest tile to understand in all of Scrabble. The X is primarily used for short, parallel plays using hotspots for 40+ points. Most of the plays using the X are either three tiles or fewer. Not only is the X a potential scoring powerhouse: it’s also one of the easiest tiles to use for most amateur players. Key words that use the X include XI, XU, AX, EX, OX, and IXIA. These words are some of the most commonly used words in all of Scrabble. One useful tactic with the X is to make a setup play. This is an especially useful tactic with a bad rack, as it gives you a good score next turn if your opponent doesn’t block. Even if your opponent knows what you’re up to, they will often need to sacrifice a lot of points if they want to block. In this case, you can play TRUNK o8, setting up XI n10 for 52 points next turn. One of the more unique characteristics of the X is its ability to score in multiple spots and multiple situations. While the X has a pretty low ceiling (it rarely scores more than 50 points) it also has a high floor: it will score 30+ points on almost any board. For this reason, sometimes it’s worth saving the X, even if a high scoring X play is available. Here, playing BUNGEE h1 (38) is better than the simple XU 14f. Because of this board, it will always be possible to score well with the X, so taking the 52 point spot isn’t essential since it will often be available next turn and even if blocked, other decent scoring X spots will still be available.